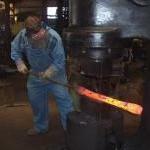 i'm trying to cast a bronze sword. can anyone give me some tips. about casting bronze alloys and ways to maek the molds. i'm thinking about a short leaf blade maybe....20" long. Well my best tip would be to go over to swordforum.com and go to the ancient weapons forum and start talking with Jeroen Zuiderwijk who has been doing a lot of bronze age casting also look through the archives for reports on an English fellow that's doing very good work. You may want to leave your positive a bit stout and hammer the edge down to get a work hardened edge. Lots of different alloys, 90:10 copper: tin is fairly representative IIRC. If I was doing it I would cast vertically with petrobond sand for the mold and leave some mass at the top to provide material to make up shrinkage. thank you very much for the reply. i was thinknig about work hardenning the edges. at one time ithought of jsut getting a flat bar of bronze and jsut forging it to shape. but i thought casting may be mroe acurate.